Last week I had the pleasure of giving a tour to a brother and sister who were in their eighty’s. Their family had been touched by diabetes several times and the sister had worked for the American Diabetes Association (ADA) for more than 40 years as an educator. They told me that they’d been waiting to visit Banting House for a long time and that they were very glad the museum was open when they arrived. Both of them were very passionate about diabetes research and were astonished to hear about some of Banting’s other accomplishments. They were definitely impressed with how Banting won his Military Cross in World War I because he continued helping to treat other soldiers after he was wounded himself. We also had a good discussion on the history of diabetes from when it was first documented in Ancient Egypt to when the first insulin vials were available. I really enjoy hearing the stories that visitors share about their own experiences relating to what we talk about in museums like Banting House. These siblings were engaged in the history of Banting House and were comfortable sharing how they had dealt with the news of family members being diagnosed with diabetes and why the sister in particular had become so involved in the ADA. They helped me to find a new perspective on how the messages we share at Banting House can have an impact on people and that what we do carries on beyond the museum door. I was really glad to have met these two and that I was able to help guide their journey of discovering more about Banting’s life. I hope that they learned as much from their visit as I did about their experiences and connections with diabetes. November is fast approaching, and that means that it’s almost National Diabetes Awareness Month here in Canada and also World Diabetes Day! To celebrate the occasion, Banting House will be having an Open House on Friday November 14 as well as a celebration from 6pm-8pm that night. We will be doing “Breakfast for Dinner”-themed activities as well as lighting Banting House up blue as part of the Blue Monument Challenge where sites around the world light up blue in support of diabetes awareness. There will be a scavenger hunt for kids and we will be reading a selection of the Dear Doctor Banting letters that have been written by visitors to Banting House. World Diabetes Day is a great time to reflect on how the discovery of insulin has improved the lives of millions of people but how there’s still a lot of work to be done to find a cure for the disease. It is a time to come together in the community and around the globe to promote awareness of diabetes. This should be a great day to come out and visit Banting House and celebrate Banting’s birthday (there will be cake!). Everyone is welcome to attend and we hope to see you there! 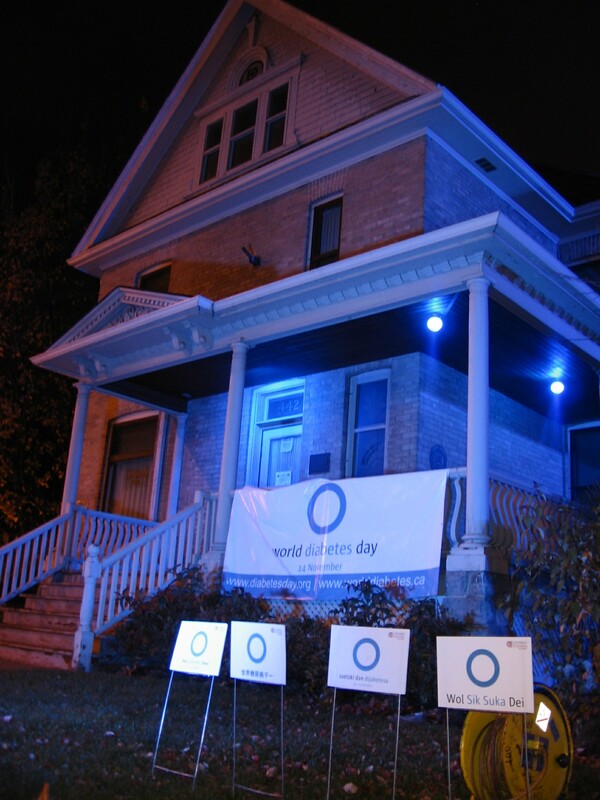 Here is Banting House on a previous World Diabetes Day all lit up for the Blue Monument Challenge! There will be more information about the event closer to the date! long time but no proper treatment has yet been found. and other diseases than others.